This end of the year Uppercase Box proved to me that I should stop judging things based on their initial appearance – there was no width to the package and everything was hardly any weight. What good could there be in this box? I’ll tell you what – this box was absolutely everything. I’m a judgy person. I judge books by their covers before I’ll even consider picking them up to read them, and I judge my subscription boxes before I’ve even opened them. How thick is the envelope? How heavy is the box? It’s sad, but it’s true and I feel like as much as we all try to not do this, to some level, we do. When this month’s Uppercase showed up in my mailbox, I grabbed it and instantly sighed. It was completely flat. Through the bag and the padded envelope I could tell most of the weight was thanks to the book, so I was instantly nervous that this was not going to be a good month for Uppercase. I was very, very wrong. So when I pulled the contents out, surprise, it was all flat and looked like a pile of papers. And then I became patient and I was blown away. The first item was a bookmark. I know, big deal you’re saying. But this handmade, wooden bookmark is absolutely stunning and I couldn’t be more excited to own this. It’s so beautiful and durable and came in its own case with a card explaining the business of Mitercraft (the masterminds behind this beauty), and what they do. I never fell in love with a bookmark so quickly. Then, the thick stack of papers. Hmm, what on Earth could beat out the bookmark, you ask? I’ll tell you what. An exclusive calendar created for Uppercase by the amazing Risa Rodil (who has done prints for Uppercase all year long), featuring 12 of the best quotes YA Literature has ever seen. Quotes are from Harry Potter, Throne of Glass, Shatter Me, The Perks of Being a Wallflower, Fangirl, Divergent, Anne of Green Gables, Tuck Everlasting, An Abundance of Katherines, The Summer I Turned Pretty, The Fellowship of the Ring. (There are two months with Harry Potter quotes). I am absolutely IN LOVE with the calendar and I love Risa Rodil’s work – I’ll be featuring each month throughout the year on my Instagram, so be sure to check it out! Finally, this month’s book was Not If I See You First by Eric Lindstrom. I’ve seen so many good things about this book, I’m super thrilled to have my own copy! As usual, this month also included a signed bookplate by Eric Lindstrom, and I’m so glad to have that! Uppercase absolutely blew me away this month and surprised me like no other box ever has. I highly recommend this box to anyone looking for a book-inclusive box, and I cannot wait for what this year brings for this subscription! If you’re interested in getting your hands on a future Uppercase, head to their site now! Have you tried Owlcrate book subscription yet? 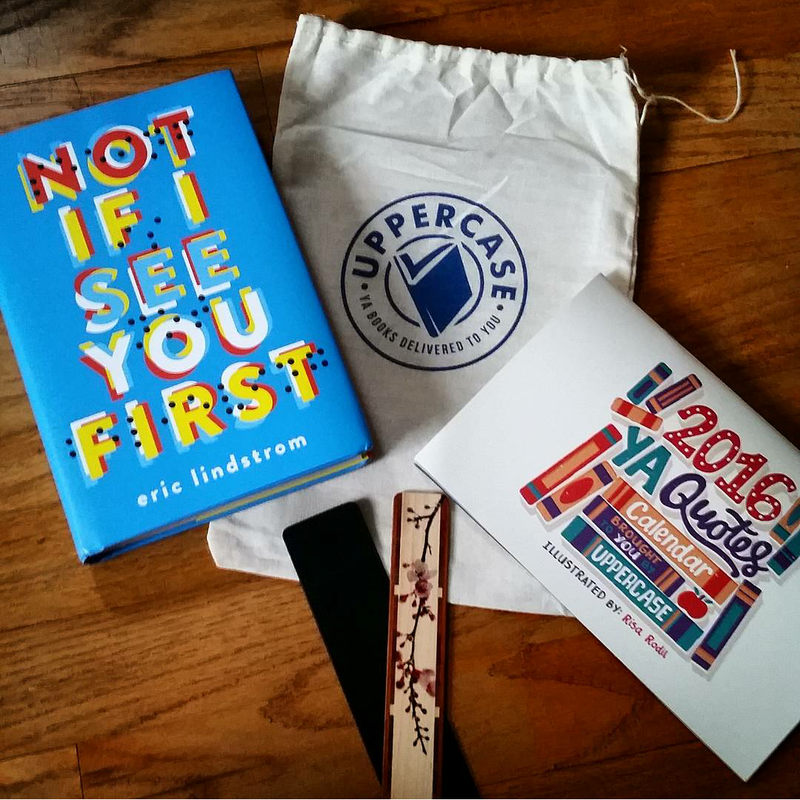 I have never heard of any other bookish subscription box you mention besides Uppercase. I am very happy I decided to check out your blog, because I have been thinking of starting a subscription soon. Thanks. I have! If you click on reviews at the top and click on subscription box reviews, I have about 6 months worth of reviews for Owlcrate. Alright thanks! I will check them out.